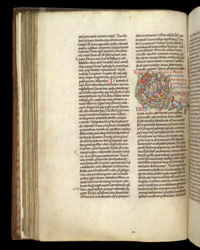 A colourful, large letter 'C' begins Book VI, below the subtitle, 'Against the Pagans'. It is alive with the energetically running horn-blower and howling dog standing in front of him. Below, the spirals of the letter emerge from the mouth of a dragon, and a pig lurks among the leaves which sprout from the letter, muching them. This sort of population of small, imaginary figures can be seen in many English works of art from the Romanesque period.